Full system available for the Yamaha Phazer. 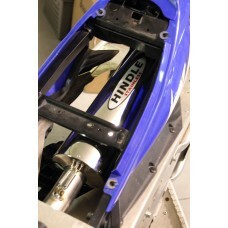 Hindle Exhaut full system for the Yamaha Phazer. Replaces the entire stock exhaust system with our super lightweight stainless steel front section and your choice of muffler finish. The Yamaha Phazer system is available in a 20" muffler length only, which keeps the system more quiet and the noise levels down. Please note: muffler is sold and priced separately.